Added support for "Sim Settlements Mega Pack - Year Two'"
Added support for "CaptainLaserBeam's Jampads - Sim Settlement Add-on'"
Added support for "Unique NPCs - Creatures and Monsters of the Commonwealth"
Added support for "SimHomestead - a Sim Settlements add on"
Added support for "Urban Food Expanded'"
Added support for "Horizon v1.5'"
Added notification "Too much caffeine. Need to sleep"
Added option "Consume item "Purified water" after category ..."
Added support for "Sim Settlements'"
Added support for "Wasteland Venturers Sim Settlements AddOn Pack'"
Added support for "Wasteland Venturers 2 - Sim Settlements Addon Pack'"
Added support for "Wasteland Venturers All-In-One'"
Added support for "Altairp's Animal Farm - Add-On for Sim Settlements'"
Added support for "Sim Settlements Add-on pack -- VaultLand'"
Added support for "Survival patch for Coffee and Donuts Workshop Pack (Creation Club)'"
Added options "Number of caffeinated products", "Consumption of caffeinated products containing alcohol", "Consumption of products from category "Never Eat""
Added support for "Vegetarian Food and Recipes'"
Added support for "Them's Good Eatin'"
Added option "Ignore "State" condition"
Added support for "Military MREs - Meal Ready to Eat - New Food"
Added support for "Wasteland Imports - Goodies from all across the Wasteland..."
Added support for "New Recipes"
Added notifications "Not Found" and "Items Left"
Food to Never Eat. Has buffs "Cure All Addictions", "Fortify Carry Weight", "Fortify Strength"
Simplest Clean Food. Has only one buff "Restore Health"
Simple Clean Food. Have buffs to health "Restore Health", "Incr. Heal Rate", "Fortify Health", "Restore Action Points", "Fortify Action Points", "Remove Radiation", "Radiation Resistance"
Radioactive Food. 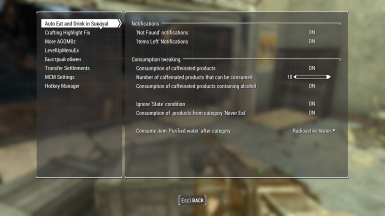 Has debuff "Radiation Damage"
Food used in Crafting. Has debuff "Radiation Damage"
Consume before "Fed" state. For Horizon users "Well Fed"
Consume before "Peckish" state. For Horizon users "Hungry"
Consume before "Hungry" state. For Horizon users "Very Hungry"
Water with Standard Disease Risk. Consume before "Mildly Dehydrated" state. Food with Standard Disease Risk. Consume before "Famished" state. For Horizon users "Famished"
Food with Standard Disease Risk used in Crafting. Food with High Disease Risk. Food with High Disease Risk used in Crafting.